Today's entry in the From Script To Page series is something that not many people have seen before, and certainly a rare script indeed. 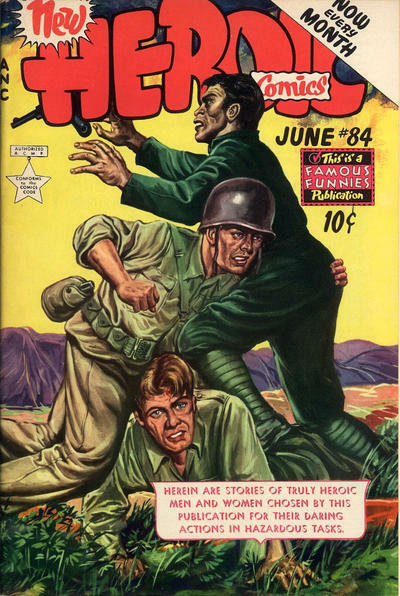 I've dug deep into my collection and dragged out a script from the Golden Age of comics, in particular, New Heroic Comics #84 (Famous Funnies Publications, June 1953). New Heroic Comics was one of those true life comics. The editors had a media service who'd send them unusual stories involving heroism by very ordinary people in society. When the stories would come in, they'd cherry pick the ones that they felt would be of interest to their readers, track down the people involved, send them a standard release and, once everyone had signed, assign the script to a staff writer who'd duly write it up using the original newspaper/magazine article as the basis.